MIDWEST DILEMMA - A guitar, red trucker hat, folk songs, and an old Toyota wagon on open road. Justin Lamoureux has been performing as Midwest Dilemma for nearly a decade. Over hills, valleys, across plains, mountains, forests, deserts, rivers, oceans and destinations near and far to share stories of life in the Midwest. But there is nothing typical about Midwest Dilemma. Lamoureux recruited 23 musical collaborators for the debut release titled Timelines & Tragedies in 2008. The ever changing and revolving cast fill out the woodwind, brass, string, and percussion sections. Timelines & Tragedies is a time line of family history. Tracing Lamoureux's ancestors to their days of French Canadian fur trading, the Great Depression, the struggles of his parents' generation with Vietnam, and eventually concluding with his life in the Omaha. Timelines & Tragedies was awarded OEA - Album of the Year in 2008 and charted CMJ Top 200. The song Chicago and North Western was featured on the PBS television series Roadtrip Nation. Live performances Midwest Dilemma can still be Lamoureux and his classical guitar or any variety of the orchestral-folk-rock ensemble. 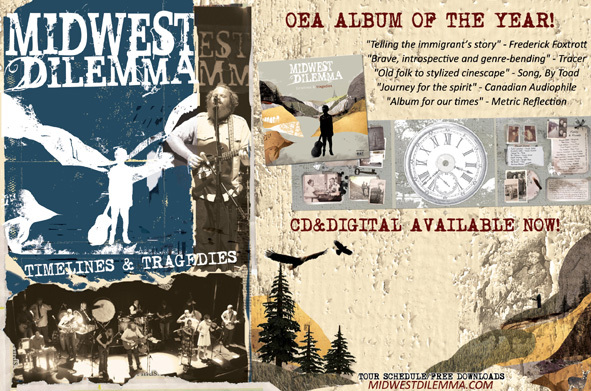 Midwest Dilemma's album Timelines & Tragedies can be purchased on iTunes or directly from www.midwestdilemma.com.